In May 2004 the winners of the Prix Ars Electronica 2004 were announced: the Wikipedia and Creative Commons. Both websites look rather unspectacular at first glance. The Wikipedia has the appearance of a portal site circa 1996 and Creative Commons exclusively discusses intellectual property law, licensing and copyright. Boring. Is this what Internet culture is all about these days? If one didn’t know any better one would think it’s definitely run out of steam. But appearances can be deceiving. Creative Commons is a successful initiative to provide a legal foundation to new attitudes on intellectual property, re-use and components of information that have been created on the Internet. The Wikipedia is an online encyclopaedia, the content of which consisting of contributions from users. It runs on a wiki, software that enables anyone to add content directly and correct or expand on contributions, without logging in and without registration. Wikis guarantee, technologically speaking, as high a level of freedom for all users as possible, but apparently human decisions are still necessary, and users are excluded. 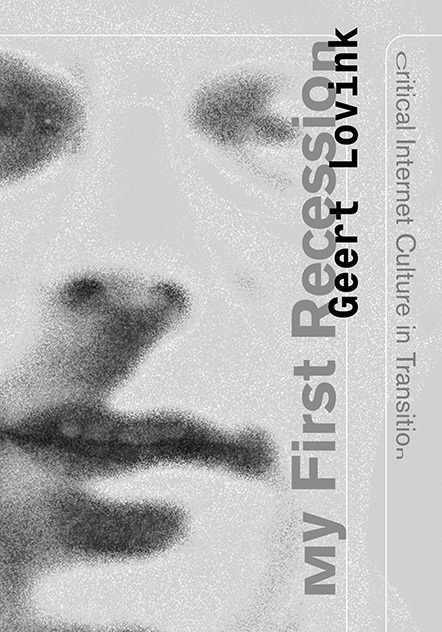 What must be sorted out in order that as much freedom as possible is guaranteed on the Internet and moreover that a proper exchange of thoughts and ideas is established, is the central subject of My First Recession, by Geert Lovink, one of the Nether­lands’ earliest Internet critics. Lovink is known for his involvement with the DDS, Nettime and Next Five Minutes, among others. He has been writing about (and on) the Internet for more than 10 years. My First Recession, Lovink’s Ph.D. thesis, is his third book in a short time. It was preceded by Uncanny Networks, a collection of interviews conducted by Lovink over the years with prominent ­figures in the field of media theory and the development of the Internet as a political and cultural space, and Dark Fiber (essays ­dating from 1996 to 2001). After years of online writing and after the end of the Internet hype, it was evidently time for a critical survey. How did it happen? What have we learned? How does it work in practice? What must we do to guarantee democratic and meaningful communication on the Internet in the future? In My First Recession Lovink analyses the way communities function as social networks. The book consists primarily of case studies on projects in which Lovink himself has been involved: discussion lists on net criticism, net art and free software, an experiment with streaming media, art education and new media, and ‘open publishing’ projects like the collaborative weblog Discordia.us. These are put in perspective by a chapter in which the ideas of legal expert Lawrence Lessig, philosopher Hubert Dreyfus and sociologist Manuel Castells are briefly examined in relation to the Internet. Wikis and Creative Commons are not explicitly ­discussed, though they are both perfect illustrations of Lovink’s pragmatic vision of the Internet. In My First Recession we get an insider’s view from an activist immersed in theory and tried and tested by practice. The book is a ‘call to engagement and responsibility’ spurred by concern about freedom on the Internet in an era of spam filters, copyright battles, bureaucracy, firewalls and the demand for security. The battle that must be fought for the freedom of the Internet, according to Lovink, is a social battle, not a technological one. Lovink concretely asks in the case studies about the boundaries you run into in ‘dirty’ practice – boundaries that any webmaster, discussion leader or moderator has to deal with. How do you guarantee that everyone’s voice is heard? And how do you make sure one individual does not ruin it for everyone else? (In Internetspeak: how do you handle trolls?) Lovink is a radical pragmatist; he always reasons based on the situation as it presents itself and looks for practical solutions. A practical solution is not the solution that an ideal theory would require; it is not the ideal solution of a technocrat, but instead a solution that works for people and, within the given circumstances, guarantees as free an exchange of ideas as possible, in the knowledge that you cannot please everybody and that someone will always be left out. This, after all, is what the practice of anything from mailing lists to wikis shows. Lovink rightly states: ‘I have never seen 100% “free” projects, there are always limitations, whether of knowledge, race and gender boundaries, or other cultural factors such as language.’ (p. 242) Moreover, survival and durability are more important for a community than any one definition of absolute freedom, for ‘it takes years to build up a social network – and only days to destroy it’. Lovink, himself a product of leftist activism, here shows himself to be critical of the call for unlimi­ted freedom propagated by both libertines and activists. Lovink views social networks as actors that play a part in shaping technology. He calls in Linus Thorvalds, the man behind Linux, to back him up: ‘It is society that changes technology, not the other way round’. That may well be, but Lovink also recognizes the effects of technology on the functioning of social networks. Technology is not an alien power assailing democracy; Lovink rightly asserts that democratic rules are imbedded in technological systems and software. It is, after all, software that partly regulates how we can and may communicate. According to Lovink, demo­cracy is an ‘agonistic culture’, a culture of actions, of doing – not a collection of laws and procedures arrived at by consensus. He subscribes to Chantal Mouffe’s idea of a radical democracy, in which the various voices in the public space are mobilised to shape democracy and consensus is viewed as a ­‘temporary result of provisional hegemony, as a stabilization of power that always entails some form of exclusion’ (p. 23). Loving may have borrowed this view of democracy from Mouffe, but it is also based on 10 years of writing net criticism, initiating and ­moderating discussions. If this book teaches us anything, it is that concept-oriented communication on the Internet is only possible thanks to social and political as well as technological factors. Moreover, decisions on technology are made by people, not always at a level where the Internet citizen has influence. People willing to take action, keep a finger on the pulse and provide criticism are constantly needed; they provide democracy. Lovink blames the fact that, for instance, no workable economic model has been found for publishing text or music on the Internet (a micro-payment system is in fact feasible) in part on the neoliberal zeitgeist, typified by the right to be left alone – don’t like this site? build one yourself! – and a blind faith in technicians – they’ll solve the problems. Laissez-faire, says Lovink, offers no solutions. We must act politically. It is clear why Wikipedia and the Creative Commons are important projects within the ­context of Lovink’s vision. They both show that we may still cherish hope for open publishing. They also show that it does not just happen. We have to roll up our sleeves in the world of ‘dirty politics’. We must design and support Creative Commons licences. Democracy and communication do not happen by themselves. Lovink’s radical pragmatism is winsome, as is his realistic view of freedom on the Internet. One might fault him for not sketching grand new vistas and not presenting things in a better light. But the reason for that is that Lovink as sought out practice for the last 15 years, instead of, let’s say, letting his imagination run wild in writing. Coming up with a critique of Lovink’s findings is in fact no simple matter. I think there are two possibilities. A fundamental criticism of his vision could address the clinging to an old definition of democracy and politics – for although technologies change and with them society, in Lovink’s thinking the idea of a negotiative democracy as an ideal remains intact. Isn’t a different radical vision needed in this regard? A sharper theorization of the relationship between technology and social dimensions would also be welcome. At the moment, amidst all the examples of practice, it remains somewhat underexposed. In addition, it is possible to offer criticism based on empirical observation, by looking at how the parts of the Internet outside Lovink’s field of vision function, such as commercial chat sites, instant ­messaging, web forums, Kazaa and Bittorrent. But one might well arrive at conclusions that are quite close to what Lovink says. It may not all be spectacular and may even seem a bit boring, but the age of speculation is long past.